These make for a great energizing breakfast topped with your choice of berries, fruit, all-fruit jelly, Greek yogurt, “Slim Belly Jelly”, or “Pancake Syrup” (also included in our free recipe section). Trim Healthy Pancakes use everyday, inexpensive ingredients, so it’s easy to make up a quick batch for yourself or feed the whole family. Our children are big fans of these pancakes. But even if it is only you eating them, it’s a good idea to try your hand at making a family batch, especially if you work outside the home. You can put some of the pancakes in the fridge for a quick grab-and-go breakfast and freeze the rest (using coffee filters or wax paper to separate the pancakes). 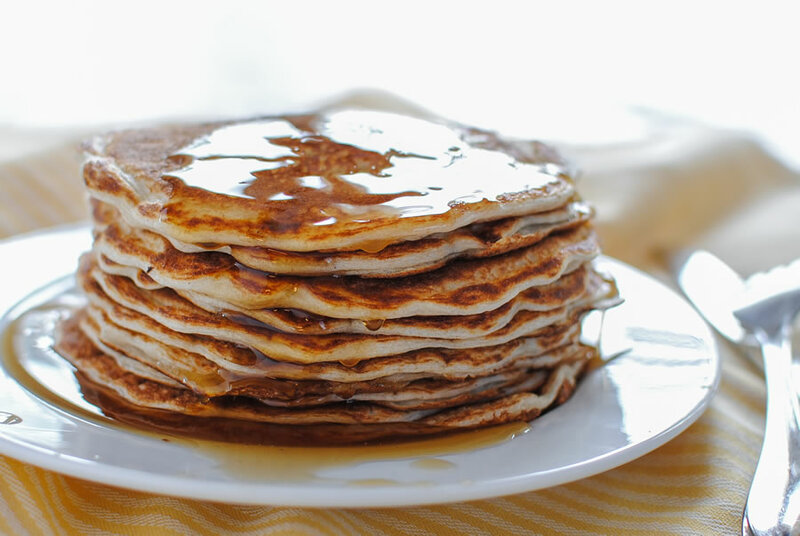 The best success in making these pancakes is achieved using a nonstick griddle and a light spray of coconut oil. The preparation is the same for both single and family-serve quantities. As waffles, they can be made in an electric waffle maker; follow the manufacturer’s instructions. Put the oats in a blender and blend until they turn into a powder. Turn off the blender and add the cottage cheese, egg whites, Super Sweet Blend, vanilla, and baking powder. Blend well, then allow the mixture to sit for a few minutes to let it thicken up. Lightly coat a nonstick griddle or nonstick fry pan with coconut oil spray and heat over low/medium heat. Ladle desired-pancakes-size amounts onto the griddle and cook until golden brown, about 3 minutes. Flip and brown the other side, an additional minute or two. When making the family-serve version, keep the pancakes warm in a 200°F oven as you make additional ones. When making the family batch, enjoy 3 pancakes for your serving.